Are There 60 Votes In The Senate For A Climate Bill? Nate Silver runs some numbers to see whether a climate bill can get 60 votes in the Senate. His conclusion: "Although the model considers only 52 Senators to be more likely than not to vote for the bill, there are somewhere between 62-66 votes that are perhaps potentially in play." But "further compromises would almost certainly be needed, some of them designed to placate as few as one senator." On the GOP side, the two Maine senators, Susan Collins and Olympia Snowe, are "possibly maybe" yes votes, and Nate's model spits out four "long shot" Republicans: Chuck Grassley, Mel Martinez, Judd Gregg, and John McCain. 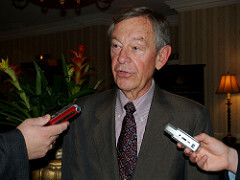 He also adds Lindsey Graham and Lisa Murkowski, and I'd throw in retiring Ohio Senator George Voinovich (right), who sits on the Environment and Public Works Committee and could help craft the Senate's cap-and-trade program. Voinovich has said he'd like to do a climate bill this session, and he seems like the likeliest "yes" of all those long shots, though he's also demanding a far weaker measure than what the House passed. And that's the main question mark here—not just whether a generic "bill" can get 60 votes, but how watered down the actual legislation will have to attract that support.